we’re trying our best to teach a toddler something new and all he can think about is how to get away! 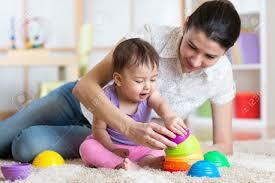 We need a way to help busy toddlers learn to stay and play! We’ve all done it… and unfortunately, it usually doesn’t result in a happy child who is ready to learn. So… what’s a frazzled parent or therapist to do? The BEST way to help a busy toddler learn to stay and play with you is by giving him a reason to include you, rather than running off to do something else. You have to make yourself and what you’re doing as interesting as possible. I’ve written A LOT about this here at teachmetotalk.com, but if you’re looking for a quick fix, the best tip is using a social game to draw a child in, teach him a fun way to participate, and finally, help him learn how to enjoy being with you. And certainly more successful than the things you’ve tried that haven’t worked! An example of the kind of game I use in therapy and teach parents to play at home is a cute play routine I call UP DOWN. Isn’t that an EASY, cute game? I love it! Watch for her response to this game. We want her to connect with you and enjoy your time playing. You can see this by a smile, increased eye contact, and hopefully, even a “twinkle” in her eyes. If he doesn’t respond positively, be more fun! Increase your own level of animation. Try a big hug after “down” to get him laughing and smiling. Another goal for this game would be for him to reach for your hands as you hold both palms out and up, as if to invite him to play. Wiggle your fingers toward him as an invitation for him to grab your hands. After you’ve played this one for a while, help your child initiate this game with you by putting him on your lap and then asking him if he wants to play by saying, “Up? Up?” but don’t hold his hands to begin. Leave your hands in your lap, or even put them behind your back, to see if your child will initiate grabbing your hands to begin. Toddlers learn through repetition. Children with difficulty paying attention need even more repetition. Play this game over and over throughout the day with several repetitions each time so that he “learns” the game. As with all our play routines, eventually your child should play this game several times in a row before moving on to another game or toy with you during your 1:1 play time. Now we can make the game even better by expanding it to new people and new contexts. 1. Play with a new person. Have the person watch you several times to learn how to play the game exactly like you do. 2. After your child likes this game, expand how and where you play. You could play this game by picking your child up from the floor, bed, or chair. Lift him high into the air for “up,” and then crash him down on his feet or bottom for “down. Find other games and instructions like this in my therapy manual Teach Me To Play WITH You from teachmetotalk.com. These ideas are the BEST way I know to teach toddlers to stay with you, play together, and enjoy being with you! Once you get them to that point, then they’re ready to learn other things from you… including HOW TO TALK! Start here. Today. For therapists, get a downloadable pdf of this game to share with parents and other caregivers who are working to help busy toddlers learn to stay and play!